The Coast Guard is the lead agency for maritime homeland security, a federal regulator, one of the five Armed Services, a law enforcement agency, and a National Intelligence Community member. No other federal agency has these diverse authorities and jurisdiction. This article highlights Coast Guard Intelligence, and spotlights its roles creating decision advantage for leaders carrying out Coast Guard missions and informing issues like force protection, cyber security, and international engagement. Access – Coast Guard missions require its personnel to operate in many places, including domestic and foreign ports and coastal and international waters. The Coast Guard’s authorities give it access to a variety of people, organizations, and areas that yield information of intelligence value. Expertise – Coast Guard intelligence personnel draw on their broad maritime experience to analyze national security threats, employing knowledge of shipping trends, smuggling modes, and the manners by which the maritime domain is exploited. Emphasis – The Coast Guard has broad authorities and responsibilities requiring it to focus on the totality of the maritime domain. No other agency supports such a wide array of both homeland security and non-homeland security maritime missions. What do we mean by “Intelligence”? Coast Guard Publication 2-0: Intelligence does an excellent job explaining the meaning of “intelligence”, which is not simply another term for “information”. Rather, it is the analysis and synthesis of material in order to determine its meaning and its implications for decision-making. It may be knowledge about an adversary, a threat, or the surrounding environment. Intelligence personnel use raw, unrelated material, such as documents found onboard a vessel, photographs, radio intercepts, patrol reports, and reports of interviews. Meaning is derived from these when combined and compared with other pieces of information, analyzed, and put into context. The result is intelligence. Intelligence activities are managed in a cycle consisting of six interrelated steps: 1) Planning and Direction, 2) Collection and Reporting, 3) Processing and Exploitation, 4) Analysis and Production, 5) Dissemination and Utilization, and 6) Evaluation and Feedback. Based on customer requirements, Coast Guard Intelligence collects and analyzes intelligence and ensures it is produced and disseminated to Coast Guard senior leaders, operational commanders, other decision-makers, and counterparts in the Department of Homeland Security, Department of Defense, and other Law Enforcement and Intelligence Community agencies. The Coast Guard Investigative Service (CGIS) conducts criminal investigations, provides personal security services, protects the welfare of Coast Guard personnel, aids in preserving the internal integrity of the Coast Guard, and supports Coast Guard missions worldwide. Comprised of both civilian and military personnel, CGIS Special Agents provide critical intelligence support to the Coast Guard through source information, undercover investigations, and working relationships with other law enforcement investigators. The Coast Guard Counterintelligence Service (CGCIS) is charged with shielding Coast Guard operations, personnel, systems, facilities and information from Foreign Intelligence and Security Services, non-state actors, and the insider threat. CGCIS confronts these various threats by leveraging investigations, operations, collections, analysis, cyber support, and appropriate partnerships in the intelligence and law enforcement communities. The Coast Guard Cryptologic Group (CGCG) informs and protects Coast Guard assets, as well as joint, combined, and coalition forces defending national and homeland security interests through actionable signals intelligence. CGCG provides cryptologic capabilities and facilitates interoperability with U.S. Navy and U.S. Cryptologic assets to enhance maritime domain awareness for operational commanders as they plan and execute Coast Guard missions. Coast Guard Cyber Program was established to improve Coast Guard network security and defense. The Coast Guard Chief Information Officer serves as the Director and reports to the Assistant Commandant for Intelligence and Criminal Investigations. The Coast Guard cyber program’s primary purpose is to defend Coast Guard networks, information systems, and data. The Coast Guard Computer Incident Response Team (CGCIRT) is the primary computer network defense operational element. The work being accomplished in the defense of Coast Guard information systems requires close coordination with the Department of Defense and Department of Homeland Security to provide indications and warnings of emerging cyber threats in the maritime domain. Though the primary goal of the Coast Guard cyber program and the CIRT is defense of Coast Guard networks, the Coast Guard cyber program has also been in discussion with DHS, other government agencies, and industry to determine roles and responsibilities for identifying and mitigating cyber risks to the Marine Transportation System. 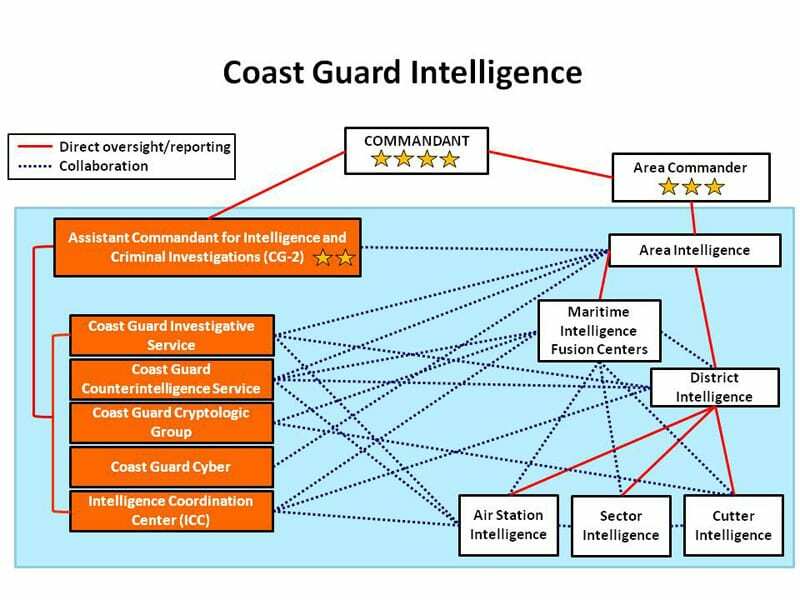 The Intelligence Coordination Center (ICC) is the Coast Guard’s national-level intelligence center – responsible for analysis and production in response to the Coast Guard’s intelligence requirements regarding the broadest aspects of national and service policy and actions. It manages collection requirements, tasking, and requests for information that pass between the Coast Guard and Intelligence Community partners. Area Intelligence Staff – The Atlantic and Pacific Area Commanders’ Intelligence staffs manage intelligence activities within their area of responsibility. They coordinate intelligence support to the Coast Guard’s Standard Operations Planning Process (SOPP) for force allocation and Global Force Management (GFM), maintain an integrated, real-time Common Intelligence Picture, and coordinate efforts with interagency and international partners. They support operators and inform decisions regarding large scale operations, force protection, international engagement, and contingency response. Field Intelligence Staffs – To most effectively conduct missions at the tactical level, intelligence personnel at districts, sectors, air stations, and cutters support the planning and conduct of operations. They help define priority intelligence requirements, collect and report information of intelligence value, and sensitize operations personnel to intelligence priorities and requirements. They perform various aspects of the intelligence cycle through collection activities, producing Intelligence Preparations of the Maritime Domain (IMPDs), and advise on how intelligence and operations align to shape risk assessment and mission execution. The Pacific and Atlantic Maritime Intelligence Fusion Centers (MIFCs) serve as the key nodes for fusion, analysis, and dissemination of maritime intelligence and information at the operational and tactical level. They provide tactical intelligence support to the District and Sector and unit intelligence staffs in their area. MIFCs specifically focus on technical intelligence capabilities, intelligence support to targeting, and analytical reach back. Field level commands determine the periodicity, level of detail, and topics for MIFC intelligence analysis and production. Coast Guard Intelligence bridges intelligence, law enforcement, military and government to support the Service’s 11 statutory missions and as a vital part of homeland security. This global enterprise provides full service, multi-intelligence discipline collection, analysis and criminal investigations capabilities. Two noteworthy success stories illustrate the importance of Coast Guard Intelligence and enterprise collaboration that drive homeland security. In January 2010, Coast Guard assets deployed in response to the earthquake in Haiti – intelligence played a significant role in supporting those operations. Intelligence personnel provided the earliest port infrastructure damage reports, which supported multi-national efforts to provide relief and port recovery. Critical to these endeavors was the development of a maritime shipping picture into and around Haiti. Coast Guard Intelligence produced threat assessments and briefings that supported force protection decisions and other national and interagency operational decisions. On 19 August 2010, Canadian naval and police forces interdicted the motor vessel SUN SEA (M/V SUN SEA) one hundred nautical miles west of the Strait of Juan de Fuca, Washington State. On board the 188-foot stateless vessel were 492 undocumented migrants from Sri Lanka. According to the migrants, their transit across the Pacific had taken approximately 40 days, although many had been aboard the vessel for months prior in the Gulf of Thailand while the smugglers made arrangements. 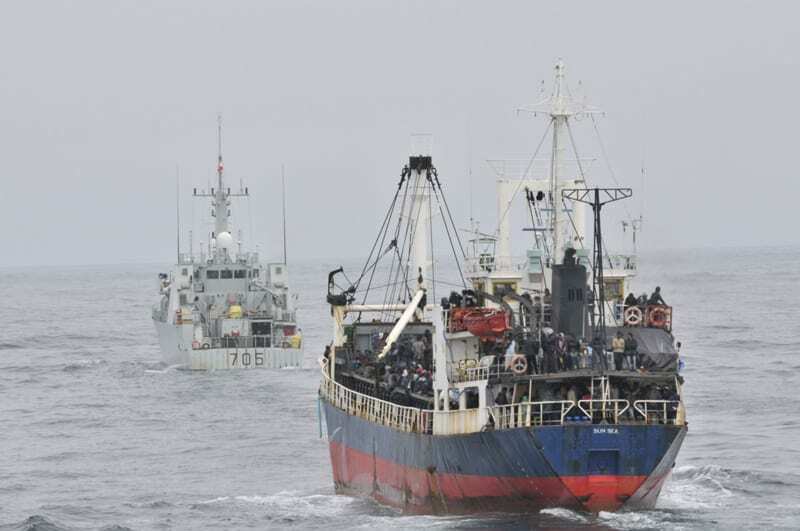 The smugglers — some of whom were associated with the Sea Tigers, the naval arm of the Liberation Tigers of Tamil Eelam (LTTE) — charged each migrant $25,000 for a berth on the cargo vessel. Coast Guard Intelligence components and commands played a critical role in this event, enabling the National Command Authority, the Commandant and operational commanders to closely monitor the case, prepare contingency plans, and effectively position response forces. Coast Guard intelligence personnel at the national, operational, and tactical levels monitored the vessel’s movements as it approached U.S. waters, worked with intelligence and law enforcement counterparts to leverage and integrate capabilities, analyzed similar past cases to make potential boarding teams aware of the conditions and responses they might encounter if given the order to interdict the vessel, and assessed the threat posed by the vessel, crew, and passengers. By providing effective, timely, accurate and usable information and warning of the event, they shaped our “maritime operational threat response” in a way that focused courses of action and conserved government resources. Border Security – More than a static line, the maritime border includes the maritime approaches to our nation and broad expanses of the exclusive economic zone. This vast and dynamic environment requires significant intelligence capabilities and services to identify and warn of complex threats from transnational criminal groups, terrorists, and proliferators of weapons of mass destruction. Tactical Level Intelligence – Coast Guard Intelligence is pursuing various initiatives and enhancements of field level intelligence capabilities to maximize tactical effectiveness of Coast Guard mission execution. Force Protection – Coast Guard members face danger from transnational criminal organizations, home grown violent extremists, and other threats. Coast Guard Intelligence integrates the various capabilities of the intelligence enterprise to support the safety and security of our units and personnel whether deployed or facing threats in the homeland. Arctic Region – The Arctic is emerging as a focus area for Coast Guard missions, requiring enhanced intelligence regarding trends and threats. Workforce Professionalization – Coast Guard Intelligence is improving our management and professionalization of the intelligence workforce. This includes the implementation of the Intelligence Specialist rating for enlisted personnel, an intelligence warrant officer specialty, and the development of intelligence field career paths for officers and civilian professionals. The Coast Guard resides at the intersection between homeland security and national defense. As a federal law enforcement agency and national intelligence community member, the Coast Guard is also positioned as a bridge between these groups. Because of our unique access, emphasis, and expertise across the totality of the maritime domain – an area where other U.S. government agencies are typically not present – Coast Guard Intelligence supports both Coast Guard missions and national security objectives. Particularly over the last decade, Coast Guard Intelligence has grown to meet the additional challenges of being a component within the Department of Homeland Security and as an Intelligence Community member. The Coast Guard has dramatically improved its organic intelligence capabilities as well as its collection, analysis and timely sharing of intelligence and law enforcement information on vessels, people and dangerous cargoes. Coast Guard Intelligence serves a distinct role to link, fuse, analyze and share information between law enforcement and intelligence community agencies. I am proud that the Coast Guard has played a major role in creating this model of cooperation – one that has become a mandate for intelligence and law enforcement agencies in today’s dynamic threat environment. The credit for this success belongs to the dedicated professionals who comprise the Coast Guard’s Intelligence Enterprise. This article first appeared in the Coast Guard Outlook 2012 Edition.